These shadows have a severe impact on system performance because the current produced by a PV module is determined by the least illuminated cell in the PV module. In this case all three PV modules have shadows cast by the over-hanging tree. In full sun we measured an output of about 5 amps with the shadows shown above. 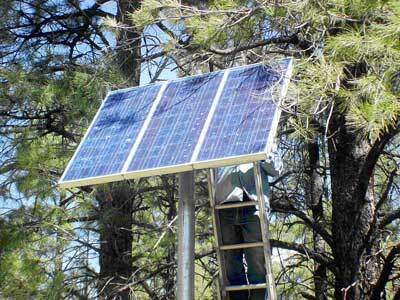 There was also an area of sap over one of the solar cells (photo does not show this). After the branches were trimmed back, the current increased to about 9.5 amps. Cleaning the sap covered area increased the current to 10.5 amps, the expected value for the three PV modules.